The Standard Luggage carry-on travel backpack is one of the best cabin bag for 2019 for many reasons, but before we jump on all the features of this bag and brand, let me tell you that we have been traveling with this cabin backpack for the past 3 years. Back in 2016, we gave up from our bulky backpacks to travel the world with carry-on luggage and it worked for a couple of years. It wasn’t an easy decision, but at that time we were tired of carrying two big backpacks and we were willing to change our packing habits. We changed from two huge checked backpacks + two small front bags to two carry-on travel backpacks that were light, spacious and modern. The years have passed by, we bought more stuff and two new suitcases, but the Standard Luggage carry-on backpack remained as our cabin luggage. We thought about changing it, but at the end of last year we put our hands on the latest version of the Standard Luggage carry-on bag and loved it. We realized that the 3rd version is even better than the one we had and it can easily win the title of the best cabin backpack for 2019. We are done with our packing story, it’s time to list all the features of our favorite cabin size backpack and why you should buy a Standard Luggage in 2019. Why Standard Luggage is the best carry-on backpack of 2019? First things first! Have I told you that this cabin luggage backpack is light and beautiful? Oh yeah baby, this carry-on backpack is spacious, modern and match with any style of traveling. It has a clean look, not too sporty, neither too flashy, making it the best carry-on backpack for international travel. The Standard Luggage carry-on backpack is versatile and it has 10 features that are essential for us, or for any traveler that want to travel light and comfortable. It doesn’t matter if you want it to travel carry-on only, or if you are looking for a carry-on backpack to go along with your suitcase, the Standard Luggage cabin bag suits everybody. The first thing you need to think when buying hand luggage is the size/weight of it. We were happy with the promise that Standard Luggage was made to fit into most of the International Airline carry-on luggage rules, but I wasn’t too sure about it. My jaw dropped when we received the bag and checked its dimensions. And indeed, it fits even in Ryanair (55x40x20 cm), EasyJet (56x45x25 cm) and AirAsia (56cx36cx23 cm) carry-on baggage allowance. Standard Luggage carry-on size: 55 x 34,5 x 19 cm when zipped and 55 x 34,5 x 24 cm when expanded. Volume /Capacity: 35 liters zipped, and 45 liters when expanded. That’s what I call carry-on luggage sized to perfection! The only tricky part is the weight of the bag after packing all your stuff. Some airlines allow 10 kg per carry-on backpack/suitcase, others only 7 kg. You need to check the baggage weight rules of your flight, so you know if that extra pair of shoes will fit or not. The weight was our major concern on giving up the checked backpack and start traveling only with carry-on luggage. Our stuff was way too heavy for the 7 kg allowance, however, for the 10kg we were fine. In some cases, we traveled with the lightest one as our cabin travel backpack and the other one we used as checked luggage. It’s not recommended, but we managed to squeeze 15 kg of stuff inside our Standard Luggage backpack and checked it. The good news is that even full and heavy the bag didn’t get damaged and the zippers were in perfect condition. The downside of putting too much weight is that the backpack becomes too heavy and a bit uncomfortable to carry. Although, the new version of the Standard Luggage carry-on backpack comes with better padding on the shoulders straps. It also has a new back ventilation system and a detachable hip belt that helps to balance the weight and relieve the pressure on the shoulders. Since we got this cabin bag in 2016, its straps have improved a lot. Not only better padding, but the 3rd version also comes on a different material [now they use neoprene] what gives you a soft feel and better adjustments. Carry-on travel backpack, carry-on suitcase, even a messenger bag, the best carry-on backpack of 2019 gives you the freedom to pack and carry your stuff the way you want. 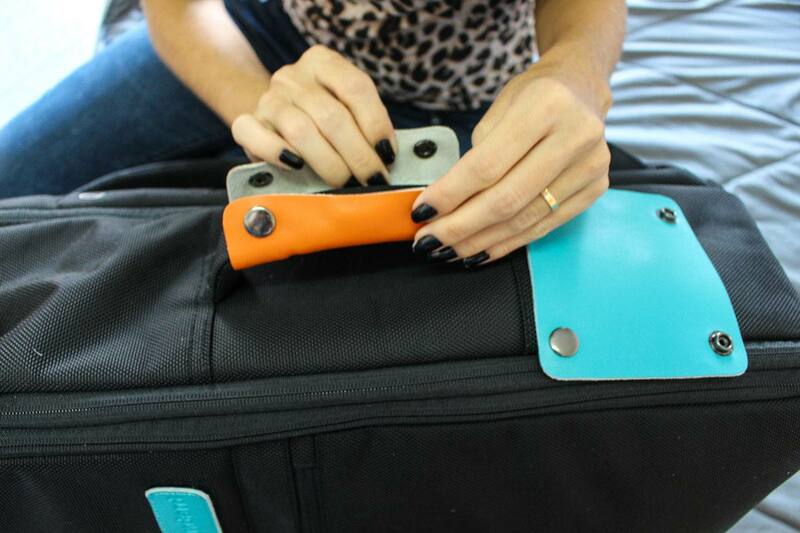 What we love in this feature is that you can adapt the cabin bag for your travel needs. If the metro or train is packed, carry your cabin backpack as a messenger bag or by its suitcase straps and you can move around easily. Want to use your Standard Luggage carry-on backpack as a checked suitcase? No problem! The backpack straps can be hidden in a back pocket that opens on the top of the bag. On the bottom, you will find two small slots where you can hide the straps connectors and keep them protected during the trip. Once you collect your bag from the luggage belt you simply pull the straps out, connect them and you are ready to use it as backpack again. As I said before, we gave Standard Luggage the title of best carry-on travel backpack of 2019 because of its modern and spacious design that combines functionality and comfort. Doesn’t matter how you choose to carry your cabin luggage, the new straps, padding, and cushions will guarantee the comfort and support you need during your travels. If carrying a cabin backpack or messenger bag is not your thing, no worries. The best carry-on travel backpack has a slot on the back where you can slide in the handle of your trolley and attache it to your suitcase. Voilà: you don’t need to carry it on your shoulders anymore! Another feature that makes Standard Luggage the best carry-on backpack is the way it opens, like a suitcase. 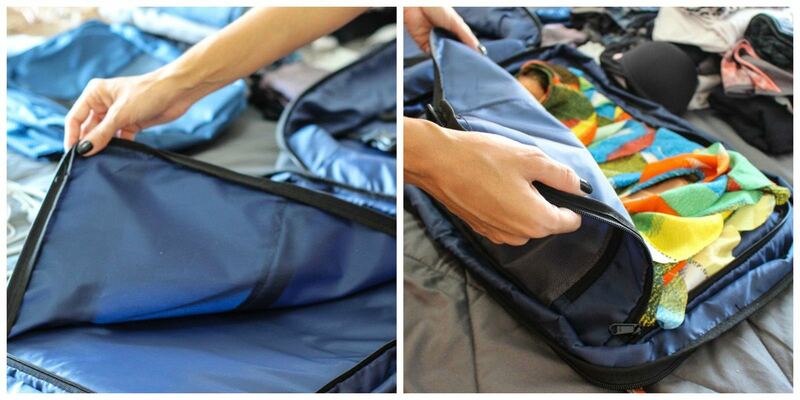 You can organize the whole bag, fold your clothes nicely, and reach everything easily. I’m a big fan of the clam-shell or full-perimeter zip system, I can’t imagine myself trying to organize my stuff only through a hole on the top of a backpack. The new version of the Standard Luggage has longer and better compression straps making easier to pack your stuff and keep them tight. Need extra space? Don’t panic! This cabin backpack has an expandable zip that instantly adds 10 liters space to your hand luggage. Just be aware that when expanded, the cabin backpack becomes bigger than the size allowed by some airlines. I hate those hand luggage that is full of pockets, where your 30 liters space are divided into 5 small compartments where you can’t fit anything bigger than a flip-flop. Said that I’m glad to announce that this carry-on travel backpack has only a few but smart pockets. This cabin luggage backpack has two external pockets that are perfect for documents, books, a bag of toiletries, and things you need to keep handy. Inside there are three big smart pockets, two of them are good for carrying underwear, socks, make up… and the third one is perfect for shirts, a jacket or a fancy dress. It’s a big and flat compartment where you can keep your special clothes without folding too much, avoiding those horrible wrinkles. The new Standard Luggage cabin bag comes with two new pockets. Inside the cabin backpack, on the bottom, you will find a hidden zipper that leads to a small pocket to keep valuables, passport, and extra cash. On the outside, the new cabin luggage has an expandable side pocket that fits a bottle of water or an umbrella. We travel full time and we work on the road, so we need a carry-on travel backpack that can keep our laptops, cameras, wires, and electronic stuff organized, protected and easy to reach. Since the first version, this cabin backpack has a special compartment for electronics on the back of the bag that worked pretty well. But after the feedback from users, the company redesigned the “office pocket” adding a detachable and suspended neoprene laptop case. It protects the computer and makes our lives easier when passing through the airport security check. In the neoprene case fits a 16.6″ laptop or a 15″ MacBook Pro. The other small pockets in the laptop area are perfect for keeping your small gadgets, wires and documents organized and safe. Panning an international trip? Check out the travel documents you must have before starting your next adventure. Most people don’t think about rain and water damage when they buy hand luggage, but you should! We consider the Standard Luggage the best carry-on travel backpack because it is made of water-resistant fabric that not only protects your stuff from getting wet, it is also easy to clean. The bag comes with a rain cover, what means extra protection and an extra point for them. For us, a carry-on backpack needs to be functional and stylish. But it’s not only beauty that matters. Standard Luggage has a modern and urban design what means that this carry-on backpack is pretty enough, but not too flashy that will catch unwanted attention and neither too sporty. This carry-on luggage matches with all style of travelers and you can carry it from the airport to luxurious hotels, to camping sites, use it for road trips and festivals. We have done it all and our carry-on backpack endured it all. Black is basic, but a sparkle of color is always welcome. To break the black block look, Standard Luggage comes with colored interchangeable leather name tags, handles, and zippers details. You can choose between orange or blue, or mix them. For couples or families, this is the best carry-on backpack because you can have a different color for each person. Be the master of packing! Maximize space on your cabin luggage by combining your carry-on bag with packing cubes. And of course, the best carry-on backpack of 2019 thought about that, you can get the combo cabin backpack + packing cubes directly from Standard Luggage. Since 2016 Rob was trying to convince me to buy packing cubes. But I always thought it would be a waste of money, that it wouldn’t help me too much as I’m already a packing savvy. Well, I was completely wrong! With our Standard Luggage, we got a set of packing cubes and a daypack/cube, and I have to admit that Rob was right. The packing cubes come in a pack of 3 units, each cube has 32 x 25 x 7,5 cm and fits a volume of 7 liters. It is a very lightweight cube, with strong and breathable fabric. Plus it has a convenient velcro interlocking system that looks like you have a personal dresser when you hang them together. 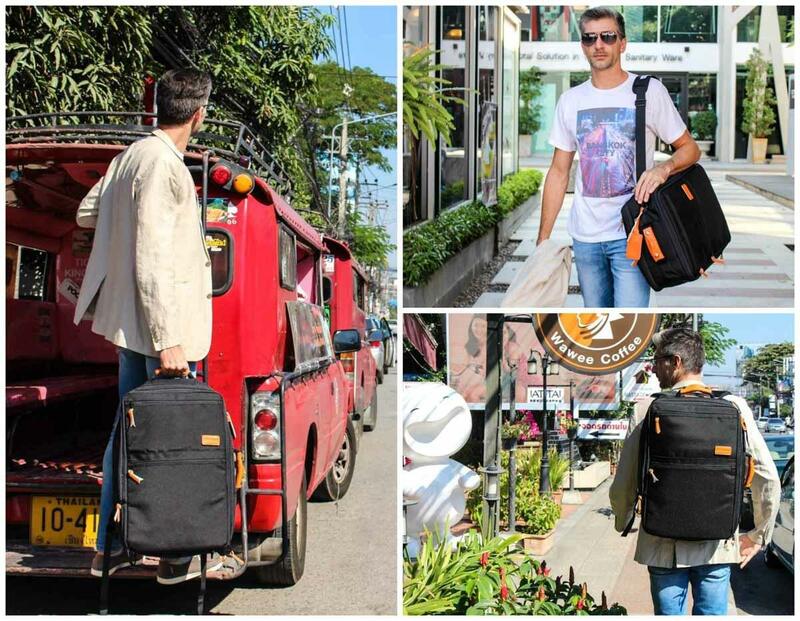 The daypack is a small backpack [38 x 25 x7,5 cm] that turns into a packing cube. It’s perfect for everyday activities, to go to the beach, parks and even fits a small laptop [I carry my 11″ MacBook inside it]. Where to buy the best carry-on travel backpack of 2019? Now you know all the new features of Standard Luggage and why it has been our favorite carry-on backpack for the past 3 years so it’s time for you to put your hands on this beauty. 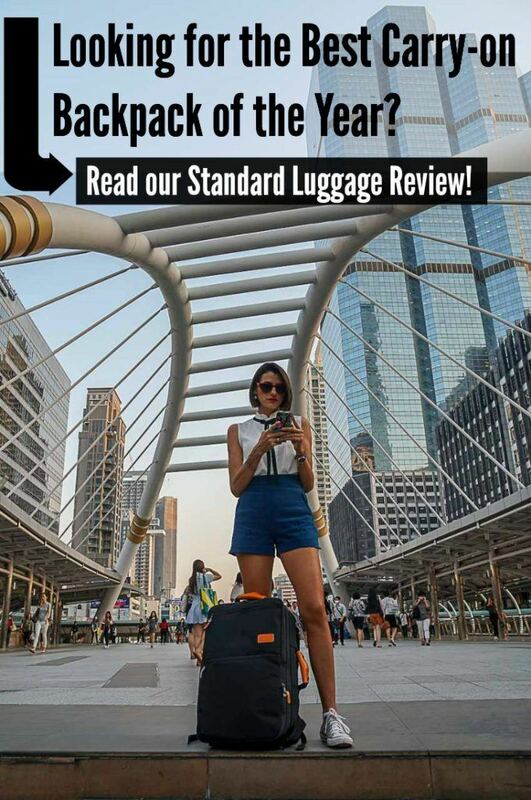 To buy the best carry-on travel backpack of 2019 is easy, visit Standard Luggage official website, place your order and receive it at your home. Standard Luggage deliveries worldwide and shipping is FREE! You might need to check your country regulations for international purchases, in some countries governmental taxes can be applied, so you might need to pay a fee when collecting or receiving it at your home. On the Standard Luggage website, you can also check all the features and dimensions we mentioned here, watch a video and see for more photos. Are you excited to buy the best carry-on luggage of 2019? So buy your Standard Luggage Now. Love this review? Pin it for later! Maybe yes. If we organize well our luggage and optimize space and don’t carry unuseful things. I’m full of backpacks and luggages, but this one seems really the perfect combination! Such a versatile bag! Would be great to have it! It looks very practical! However, it seems to big to take for free on cheap European flights. I try to do carry-on only when I travel. I hate waiting for checked bags at the airport, and the possibility of my bag getting damaged or not arriving on my flight is enough to make me do carry-on. I actually have the Standard Luggage bag. Since I mainly fly Air Asia, I’ve never been able to take it as a cabin bag. With only a 7kg allowance, that’s just over 5kg of stuff! Maybe okay for a weekend away but impossible for long term travel esp with a laptop. Tbh, I can’t carry it with the shoulder strap. It cuts into my chest bone too much. The backpack straps are great. I had about 13 kg of luggage and found it difficult to deal with but I’ve cut down to 12kg and it is suddenly manageable! Thank you for doing this give-away! I have been on the search for a good travel backpack. Yes, you should definitely go for the Standard Luggage carry-on. It looks like it would be easy to organize. 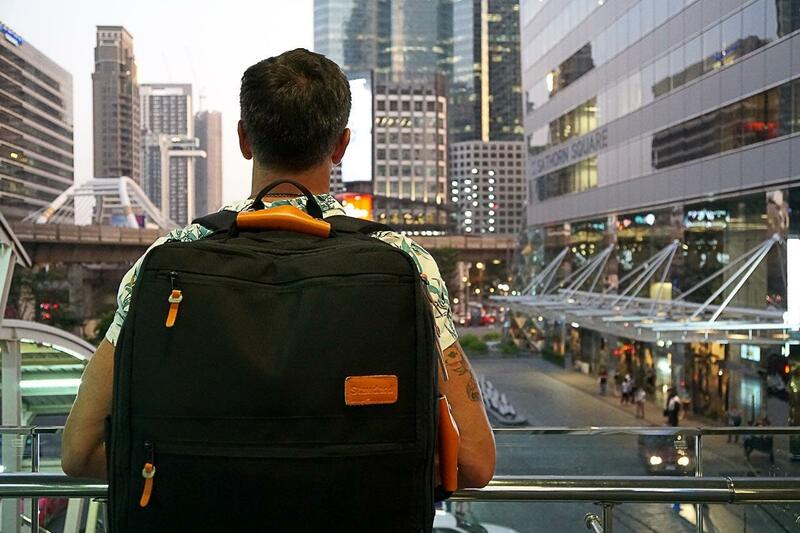 You get the best of three worlds and it looks more stylish than a traditional backpack. Based on your post, sounds like it’s definitely worth a try! I would love to use this on future Air Asia flights, since I fly AirAsia quite often. My current daypack is a bit too small to fit all the stuff but a traditional carry-on is inconvenient to carry around. I’m planning a few weekend trips throughout Europe, and this bag would be ideal! Starting off in Berlin in June! Darn its over. Maybe next time young lady! We are very happy to announce the winner: Mr. Kenzo M.
Stay tuned that soon we will have one more giveaway! Don’t tell me! Those minutes waiting for the bag feels like eternity! Standard’s Carry-on Backpack now is its 3rd version. Over the last few years we’ve taken an extensive amounts of feedback to improve the design in what we feel is the best version yet! Tks for the update Ryan! You are welcome!!! Good Luck! !